Dr. Raun Melmed, co-founder and medical director of the Southwest Autism Research & Resource Center joined the May Grandparents Group meeting to discuss the importance of the extended family's support of individuals with autism. 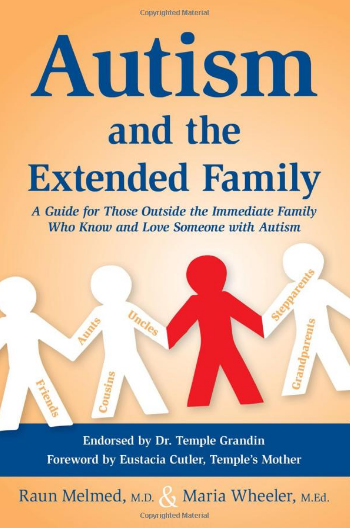 Dr. Melmed also shared information from his new book, Autism and the Extended Family: A Guide for Those Outside the Immediate Family Who Know and Love Someone with Autism. In the book, Dr. Melmed and co-author, Maria Wheeler, M.Ed., focus on the impact a child's autism diagnosis has on the entire family, including extended family members and friends. 1. If extended family members learn, understand and participate more in the child's life, outcomes for the child and the family can be positively affected. 2. All extended family members need to be well aware of their own personal strengths and weaknesses along with any past events that may present challenges to working together for a common cause. 3. Being brave and working through any conflicts is extremely important, even in the face of drama or hostility that may arise. 4. The first priority is always the child and his or her immediate family. 5. Learning as much as you can about autism is critical to being an effective source for change, growth and support. “They say it takes a village to raise a child. A child with autism needs a team and every member of the extended family needs to participate in the child’s development. Autism is definitely a family affair,” said Dr. Melmed.